Corneal Refractive Surgery: continues to advance every day. IntraLASIK is a procedure in which the corneal flap that needs to be created in the surgery is created by a laser vs. a microkeratome. For all practical purposes, a microkeratome is a surgical blade that is passed through the cornea to create the corneal flap. The majority of complications that occur in refractive surgery are secondary to the use of this blade. In IntraLASIK, an ultraviolet laser beam is used to create a precise, uniformly created flap. The accuracy of the laser (+/- 10 microns) is unparalleled by any other technology in vision correction surgery. This advanced technology puts unprecedented control in the hands of the surgeon, and even allows him to customize the corneal flap for every individual patient. Because of its consistent accuracy, IntraLASIK now makes it possible to treat many patients who were dismissed as candidates for laser vision correction due to thin corneas. Wavefront Analyzers: are used to map "aberrations" in the eye. Several types of visual imperfections, referred to as lower- and higher- order aberrations, exist within the eye and can affect both visual acuity and the quality of vision. To date, only lower-order aberrations such as myopia, hyperopia, and astigmatism could be measured and treated. But these do not account for all potential vision imperfections. Higher-order aberrations can also have a significant impact on one's quality of vision and are often linked to visual glare and halos that may cause night vision problems. Higher-order aberrations cannot adequately be corrected with glasses, contact lenses, or conventional LASIK treatments but can now be corrected with IntraLASIK procedures. The wavefront analyzer maps both lower and higher-order aberrations by projecting waves of light into a patient's eye and mapping the waves that bounce back. 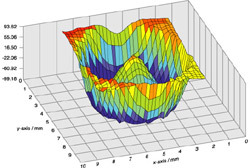 By comparing the patient's wavefront with a model of perfect vision, doctors are able to create a personalized 3D map of the exact corneal reshaping needed for each patient to address both lower and higher-order aberrations. 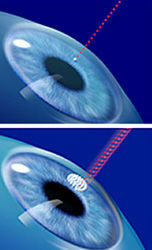 To create a "customized" LASIK procedure, the map is then electronically transmitted to the laser, enabling the surgeon to address the patient's unique visual requirments. (American Optometric Association News, Vol. 41, No. 19, 4/7.03).